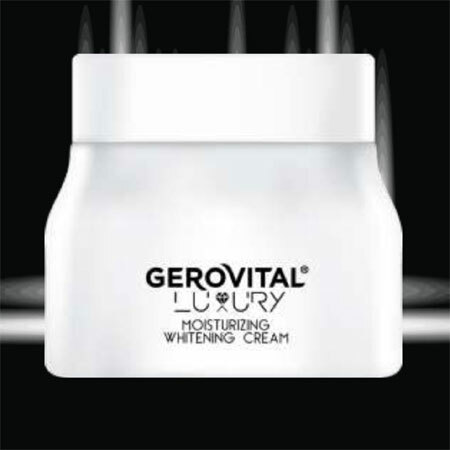 The Gerovital Luxury Moisturizing Whitening Cream reunites innovative active principles which favor depigmentation, unification, and restoring of the complexion’s brightness. It contains: Alpha Arbutin, inhibitor of the tyrosinase enzyme. Niacinamide and liposomal Vitamin C with anti-oxidative and brightening roles, as well as the multifunctional peptide complex intended for whitening - DermaPep™UL Neurophroline™ mitigates the reactivity of skin cells to stress having positive effects on the skin’s brightness and coloration. Usage: Apply twice a day, morning, and evening, for at least 2 months, on the areas with intense coloration or on the entire face. During daytime associate it with a solar protection product and, if required, with a soothing action one. Effective UV protection should be provided in order to avoid exposure to sunlight throughout the entire duration of use, as well as the application of products with sensitizing potential. Apply twice a day, morning, and evening, for at least 2 months, on the areas with intense coloration or on the entire face. During daytime associate it with a solar protection product and, if required, with a soothing action one. Effective UV protection should be provided in order to avoid exposure to sunlight throughout the entire duration of use, as well as the application of products with sensitizing potential. INGREDIENTS: AQUA, GLYCERIN, SQUALANE, UNDECANE, BUTYLENE GLYCOL, PENTYLENE GLYCOL, NIACINAMIDE, DIMETHYL ISOSORBIDE, DIMETHICONE, CETHYL ALCOHOL, GLYCERYL STEARATE, TOCOPHERYL ACETATE, SILICA, alpha ARBUTIN, DIPALMITOYL HYDROXYPROLINE, GLYCERYL BEHENATE, PHENOXYETHANOL, TRIDECANE, PEG-75 STEARATE, HYDROXYETHYL ACRYLATE / SODIUM ACRYLOYLDIMETHYL TAURATE COPOLYMER, CETETH 20, STEARETH-20, TETRASODIUM EDTA, PROPANEDIOL, PARFUM, POLYSORBATE 60, TOCOPHEROL, GLUCOSYL CERAMIDE, DECYLENE GLYCOL, CAPRYLYL GLYCOL, HYDROGENATED PALM GLYCERIDES CITRATE, GLYCINE SOJA OIL, METHYL UNDECENOYL LEUCINATE TEPHROSIA PURPUREA SEED EXTRACT, SODIUM HYDROXIDE, BENZYL SALICYLATE, BENZYLSULPHONYL D-SERYL HOMOPHENYLALANINE AMIDINOBENZAMIDE ACETATE (SYN-UP™), CITRIC ACID, LIMONENE, LINALOOL.